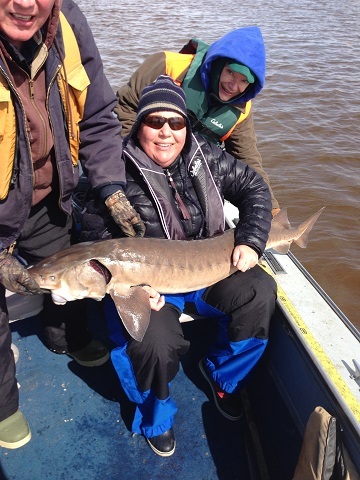 Sturgeon Fishing - - - 9 messages. Showing 1 through 9. 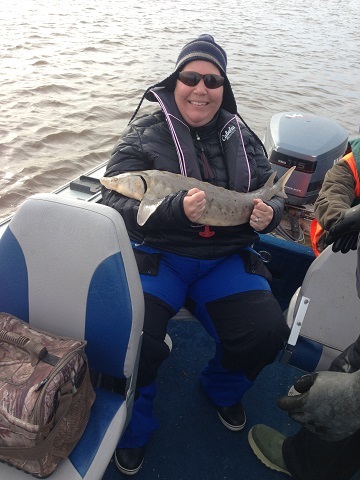 I am headed sturgeon fishing for the weekend on the Rainy River on April 25th sans Bobber Down. I am beyond excited and I know BD is SUPER jealous! 12 women are going as apart of the BOW (becoming an outdoor woman) program through the MNDNR. 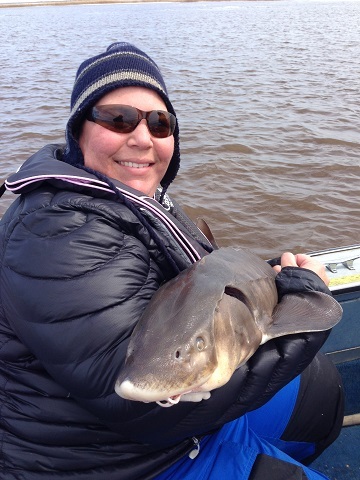 I have never gone sturgeon fishing so I am really excited to learn the ins and outs of it! Hopefully mother nature will take care of all the ice! Get ready for the fight of your life! We'll be up there shortly after you. We delayed the trip for the second year in a row now due to the ice. Yes I'm jealous I have wanted to go for many years, but never nailed it down and booked a trip! I'm sure you will have a great time and make some new friends in the process! 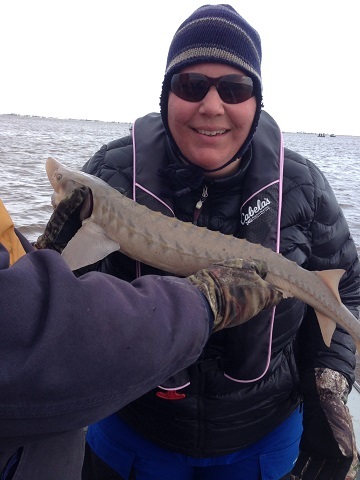 I had an amazing weekend of sturgeon fishing on the Rainy River. We went out about 10 on Saturday morning for the day. The weather was great! Sun was shinning. Still a bit chilly but no need to gloves! We fished in about 19 feet of water. I caught my first sturgeon within 10 minutes of being out. He was a whooping 55 1/2 inches! Took about 20 minutes to get in the boat. I have never had so much fun getting a fish in the boat! What an experience! My second was a 45 1/2 inch. Third was a 37 inch. The other ladies in my boat had never really fished before. And they caught 2 walleyes. One 26 inch and the second 27 1/2 inch. As a walleye fisherwoman myself I was super excited about those fish! The ladies had no clue how awesome it is to catch walleyes that size. Sunday we went out at 9. It was SUPER windy at about 30mph and overcast. We set up in about 24 feet of water hoping our anchor would hold. It took about an hour to catch my first one of the day. He was 30 inches. We were all pretty miserable and cold so we were going to leave at 11am. At 10:45 one of the other ladies got a bite. After 45 minutes of wrestling we pulled in a 64 inch 70 pound sturgeon. It was AWESOME! The guy fought hard! The DNR was out all weekend tagging fish. 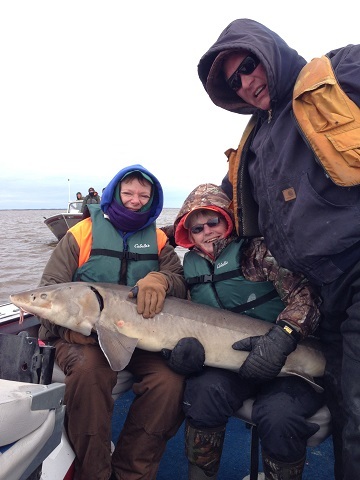 They are doing a sturgeon population survey this year and need to tag 1400 fish! Now I am ready for some walleye fishing in a few weeks! I'll get webdude to post some pics! Great job and great pics! So Proud of you and Happy for you!! !